Receive One Day Early Season Admission for $39.99 when you purchase at least 1 All Ages (3+ yrs) ticket. Applies to: One Day Early Season Admission - Limited Time Only admission type(s). Dates of use: For use between April 09, 2019 and June 16, 2019. 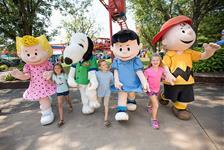 Receive $49 Admission & All Day Drinks when you purchase at least 1 All Ages (3+ yrs) ticket. Applies to: Early Season Admission & All Day Drinks - Limited Time Only admission type(s). Contact us for support or help booking your trip at 1-844-993-3238.